Human 4-1BB Ligand, Mouse IgG2a Fc Tag, low endotoxin (41L-H5254) is expressed from human 293 cells (HEK293). It contains AA Ala 50 - Glu 254 (Accession # P41273-1). The protein has a calculated MW of 48.3 kDa. The protein migrates as 47-50 kDa under reducing (R) condition (SDS-PAGE) due to glycosylation. 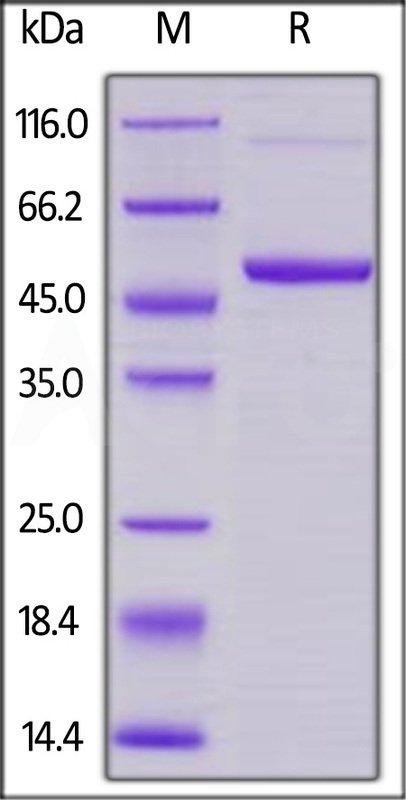 Human 4-1BB Ligand, Mouse IgG2a Fc Tag, low endotoxin on SDS-PAGE under reducing (R) condition. The gel was stained overnight with Coomassie Blue. The purity of the protein is greater than 90%. Immobilized Human 4-1BB, His Tag (Cat. No. 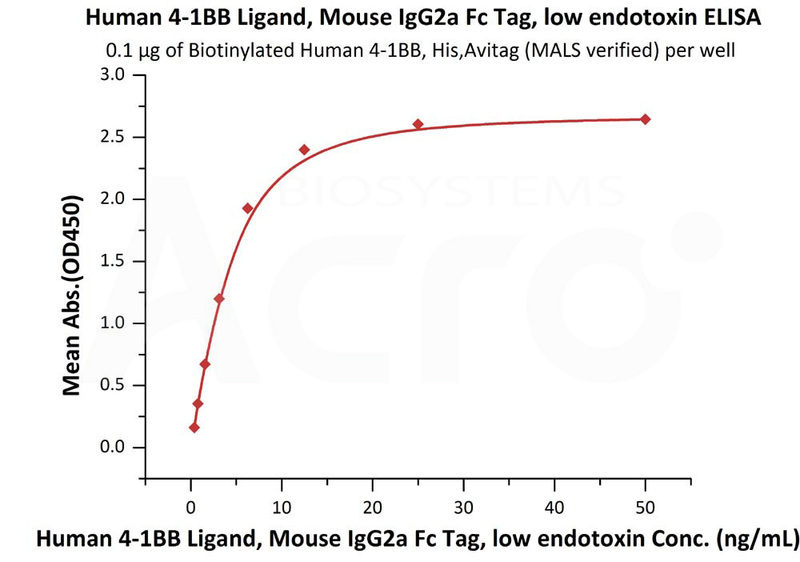 41B-H5227) at 2 μg/mL (100 μL/well) can bind Human 4-1BB Ligand, Mouse IgG2a Fc Tag, low endotoxin (Cat. No. 41L-H5254) with a linear range of 0.16-2.5 ng/mL (QC tested). Tumor necrosis factor ligand superfamily member 9 (4-1BBL) is also known as 4-1BB ligand, CD137L or TNFSF9, which is a cytokine that binds to TNFRSF9. 4-1BBL is the high affinity ligand of 4-1BB. 4-1BBL induces the proliferation of activated peripheral blood T-cells. Also, 4-1BBL may have a role in activation-induced cell death (AICD). Furthermore, 4-1BBL may play a role in cognate interactions between T-cells and B-cells/macrophages. As for diseases, 4-1BBL is involved in cancers, infectious diseases and autoimmune diseases. (1) Won E.Y., et al., 2010, J. Biol. Chem. 285:9202-9210. (2) Alderson M.R., et al., 1994, Eur. J. Immunol. 24:2219-2227.